With the waning of the communist threat in the late 1980s, the opening up of China under Deng Xiaoping, the disintegrating Soviet Empire, the fall of the Berlin Wall, Singapore shocks the international stage by arresting 22 persons under the harsh ISA for a "Marxist Conspiracy". Many cried: What Communist threat? This is the government trying to silence its critics and strike fear in political opposition! 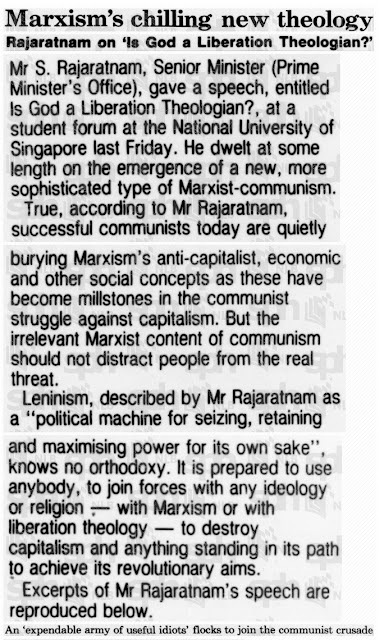 The respected PAP ideologue and co-founder S Rajaratnam, himself a Marxist during his days in London when he joined the Marxist Left Book Club, puts forth his argument of a new Marxist-Communism that will continue the struggle against capitalism using Christianity as a cloak of legitimacy. 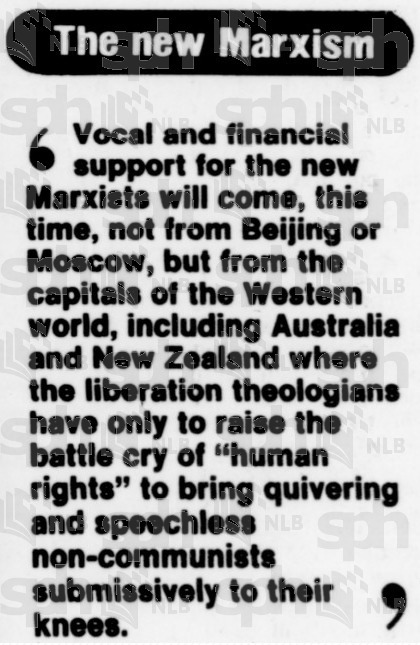 Liberation theology as it was termed, was active in certain impoverished parts of the dominant Catholic Philippines and South-America, Rajaratnam argued that the communists subverted the Christian idea emancipation for the under-privileged as a means for the communists to gain political power. Rajaratnam further argued that support for these Marxists would no longer come from Beijing or Moscow but from western democracies under the guise of "human rights". While one can't win an argument with a dead man, his thoughts are plainly laid for debate. 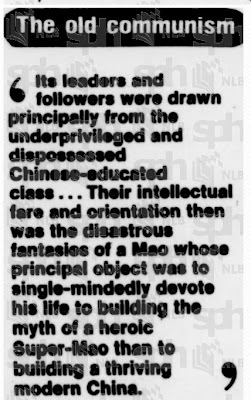 His speech to NUS students was carried in the Straits Times on 20 Aug 1987 and the first part reproduced here. Do stay tune for the rest of his speech. Did Rajaretnam really believe what he said here or was he trying to justify the action taken against social activists with a strong church affiliation?